Story by Kelly Murphy with photos by Victoria Hagens. 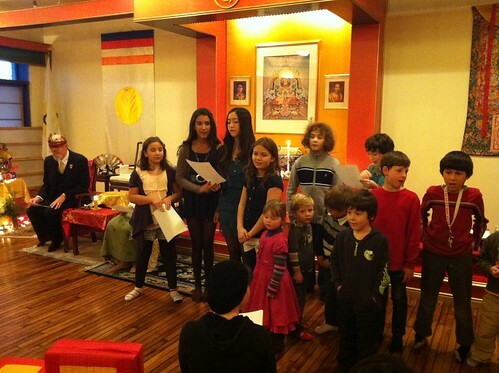 On December 17, 2011, we celebrated Children’s Day and the Winter Solstice at the Toronto Shambhala Centre. 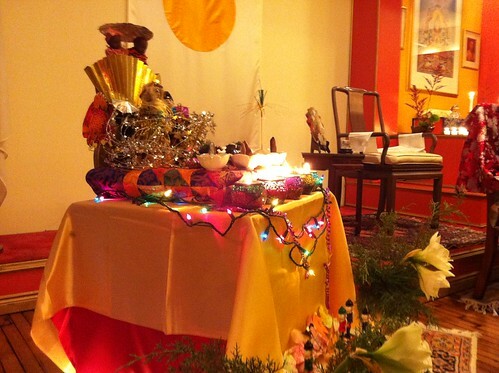 It was one of the most elegant, cheerful, and inclusive events I have ever attended at the Centre! Many congratulations are deserved by Ruth, Sangye, Victoria, and John Crone, who created a day in which all the dignities were vividly manifest! First there was joyful and energetic play, then we experienced quiet contentment and friendliness as we listened to and talked about Shambhala teachings together. Then there were some outrageous talent performances, including singing, joke-telling and martial arts. Perhaps most moving was a candle-lighting ceremony to symbolize our appreciation for the winter light in the sky and the Great Eastern Sun in our hearts. This simple, orderly, and yet profound ceremony (involving twenty lit candles and zero mishaps!) reflected a quality of inscrutability. To close the ceremony, the children sang a song composed by Tara Slone, who taught it to the Bodhi School about three years ago. All told, about fifty people – kids and grown ups – took part in the activities, which culminated in a delicious potluck supper and a massive Gingerbread House for dessert (thanks to Ethan, Daniel, Henry, and Arthur for building the Gingerbread house!). The roles of King and Queen of Shambhala were played by Tom and Jacquie Bell, who are the parents of Victoria Hagens and grandparents of Henry and Arthur. 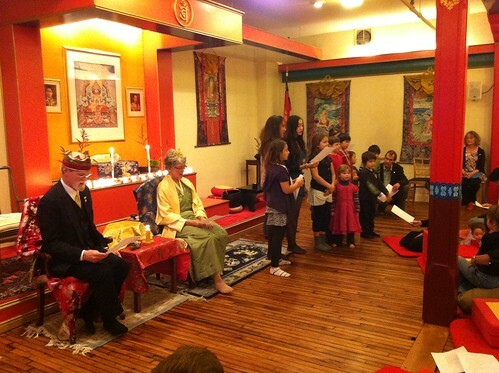 This was their second time as King and Queen in Toronto; they have also served as King and Queen at Karme Choling in the past, and they have celebrated Children’s Day with their own children for more than thirty years. They were majestic! What impressed me most about Children’s Day was the way that they spoke to the children about basic goodness, Great Eastern Sun, and the Shambhala view. The King and Queen were gentle, but their talks were not a bit simplified, or “watered down” for a junior audience. 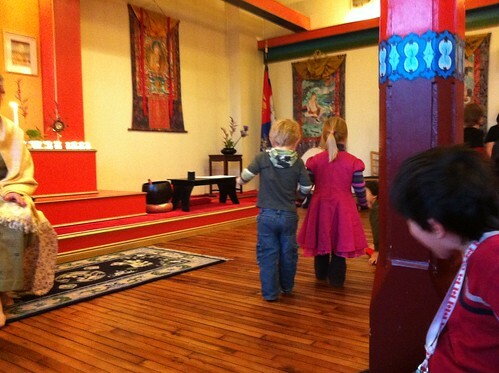 They offered exactly the same messages that adults hear in the Shambhala teachings. And the children responded with a lot of confidence and curiousity. It was an experience that reminded me that the Shambhala terma matters for everybody, is accessible to everybody, and can inspire everybody. All human beings can connect to it, and through it we can connect to one another.